April 2, 2019 (San Diego)--The National Weather Service has issued a wind warning in effect from noon today to 11 a.m. tomorrow for San Diego’s mountain and desert areas. Southwest winds of 20-30 miles per hour with gusts up to 60 mph are forecast. Watch for blowing dust or sand in these areas and use caution if driving a high-profile vehicle. March 11, 2019 (San Diego) – A winter weather advisory from the National Weather Service is in effect from 3 p.m. today until 12 noon tomorrow. Snow is forecast above 5,500 feet in mountain areas of San Diego, San Bernadino and Riverside Counties. Update 10:38 a.m. -- CHP is now escorting vehicles on I-8 between Alpine and the county line. Expect delays. February 22, 2019 (San Diego's East County) -- East County's mountain areas look like winter wonderlands, with two feet of snow atop Mt. Laguna and several inches or more in Julian (photo, left, webcam in downtown Julian). But winter conditions have wreaked havoc with motorists. After many vehicles incuding a semi-truck and a school bu skidded on icy conditions along Interstate 8, authorities shut down I-8 from Alpine to the County line last night. It remains closed this morning, though the CHP has been escorting stranded motorist through the area. February 20, 2019 (San Diego's East County) -- A storm tonight coupled with a cold front is forecast to drop snow as low as 1,500 to 2,500 feet, the National Weather Service predicts. That could mean rare snowfalls in Ramona, Alpine, or even atop Cowles Mountain. At higher elevations, 2 to 5 inches are forecast above 3,000 feet in areas such as Julian and Descanso, 6 to 12 inches above 5,000 feet including Mount Laguna and Palomar Mountain, and 12 to 16 inches above 6,500 feet including Cuyamaca Peak. The storm is expected to bring rainfall of .25 to 1 inch to San DIego County's coastal and desert areas. A frost warning has been issued for Thursday and Friday morning. February 15, 2019 (San Diego’s East County) – Yesterday’s Valentine’s Day storm dropped 10.10 inches of snow on Palomar Mountain, breaking a record of 9.58 inches set way back in 1901. The storm also brought sweet relief to drought-stricken Borrego Springs, dropping 2.68 inches of rain on the desert community. Other new records included Ramona with 4.02 inches, Campo with 3.75 inches, and Alpine with 2.94 inches. Lillian Trautman of El Cajon sent in the video above, showing her El Cajon yard turned into a rushing torrent of water. February 6, 2019 (Laguna Mountain) – Five days of storms have blanketed local mountains including Mount Laguna with up to a foot of snow, the National Weather Service reports. Julian, Pine Valley and Descanso all received snow. The storm also doused much of the county with heavy rains, including up to six inches in some locations. February 4, 2019 (San Diego’s East County) – The National Weather Service has issued a winter storm warning in effect now through 4 a.m. Wednesday for heavy snow in the mountains of San Diego’s East County. The snow level could dip down to 2500 to 3500 feet, with six to 12 inches of snow above 4500 to 5000 feet. February 1, 2019 (San Diego's East County) -- A powerful storm is forecast to bring heavy rains and powerful winds countywide tonight through Saturday night, according to the National Weather Service. The storm could bring up to 4 inches of snow in mountain areas and a half inch in deserts, with 1.25 inches forecast in inland valleys and the coast. Strong winds with gusts up to 70 or 80 miles per hour in mountain and deset passes are also forecast, so secure loose items such as patio umbrellas. Flash flooding, urban flooding and debris flows are possible in some areas. Another storm is expected to reach our region Sunday morning, with lighter rainfall Sunday and Monday. January 11, 2019 (San Diego’s East County) – Heavy rain and snow is forecast to fall starting tonight, with several new storm systems from the Pacific northwest slated to reach our region next week. According to the National Weather Service, tonight and tomorrow morning should bring a half inch of rain west of the mountains and up to an inch or rain in the mountains, with several inches of snow above 6,000 feet including Palomar Mountain. Be prepared for a brief period of very heavy rain and strong surf. January 4, 2019 (San Diego's East County) -- A new storm is heading to our region. The National Weather Service predicts rain and snow down to 5,000 feet elevation late Saturday and Sunday. December 31, 2018 (San Diego's East County) -- Frost and freeze warnings and watches are in effect for much of our region tonight through Thursday, with snow levels forecast to dip down to 3,500 feet. Temperatures could fall as low as 25 degrees in some East County mountain and desert areas – cold enough to freeze pipes and sensitive plants. High winds are also forecast across inland valleys, with gusts up to 75 miles per hour. Light showers and snowfall fell at higher elevations today, with additional precipitation expected through 10 p.m. tonight and icy roads likely. December 22, 2018 (San Diego’s East County) – Two storms are forecast to bring strong winds up to 60 mph, chilly temperatures and rain to our region starting Tuesday, Christmas morning, through Friday. Light snow may fall above 5,000 feet, with up to two inches of snow potentially bringing a whtie Christmas atop Mount Laguna and Palomar Mountain, our region’s highest peaks. Photo by Robert Gehr, left: El Cajon Library closed temporarily due to flooding. December 7, 2018 (San Diego’s East County) – Storms over the past two days brought much needed rain to our region, up to 3 inches in some areas. But the downpour also causing flash flooding in many areas. Several cars became caught up in rushing water up to four feet in southeast county, where major flooding occurred on Otay Lakes Road by Pio Pico RV Park and also on Highway 94 between the Jamul Casino and Jamul Estates. Jan Hedlun, a motorist delayed due to the flooding, says that 45 minutes after Cal Trans closed the highway, “There was no one directing traffic or telling stranded travelers to turn around and find another way home, as there has been during priori events. “No signs were being posted to prevent people from coming down Highway 94.” She asks why CHP or Border Patrol agents were not brought in to assist and why funding has not been allocated to fix the roads/drainage in these two recurring trouble spots. In El Cajon, the County Library is closed today due to damage inside caused by flooding. Thunder, lightning and power outages also occurred across the region due to the storm. December 6, 2018 (San Diego) -- The National Weather Service has issued flash flood watchings, warnings and advisories across our region. A flash flood warning, the most severe alert, is in effect now through 8:30 p.m. for Chula Vista, Descanso, El Cajon, National City, La Mesa, Poway, Imperial Beach, Ramona, Coronado, Alpine , portions of the San Diego city limits, and Mission Valley. An advisory is in effect for a broader area spanning the entire county from coasts to deserts. Thunderstorms are producing heavy rain across the warned area. A half to nearly an inch of rain has already fallen with another inch or more expected. Do not attempt to drive across a flooded roadway and stay indoors during thunder and lightning. October 12, 2018 (San Diego)-- A storm is forecast to bring rain across our county tonight through Saturday night. Rainfall will be heaviest over the mountains with thunderstorms predicted. RED FLAG WARNING THROUGH TUESDAY: POTENTIAL FOR "EXTREME FIRE BEHAVIOR"
August 6, 2018 (San Diego’s East County) – The National Weather Service has issued a red flag alert in effect from 4 p.m. today through 9 p.m. Tuesday for all of San Diego County and much of Southern California. “.If fire ignition occurs, conditions are favorable for very rapid fire spread including long range spotting, and extreme fire behavior which would threaten life and property,” the NWS warns. Those conditions include strong winds, dry fuels and hot, dry weather. Triple digit heat is forecast inland. Read more about RED FLAG WARNING THROUGH TUESDAY: POTENTIAL FOR "EXTREME FIRE BEHAVIOR"
Locations impacted include... Warner Springs, Hwy 79 Between Santa Ysabel And Warner Springs, Lake Henshaw, Ranchita, Hwy S2 Between Hwy 79 And Hwy 78, S7 - East Grade Rd, Hwy 78 Between Ramona And Santa Ysabel, Hwy 79 Between Warner Springs And Oak Grove, Santa Ysabel, Los Coyotes Indian Reservation, Wynola and Santa Ysabel Indian Reservation. PRECAUTIONARY/PREPAREDNESS ACTIONS... For your protection move to an interior room on the lowest floor of a building. April 15, 2018 (San Diego’s East County) – The National Weather Service has issued a high wind advisory in effect starting at midnight tonight through 5 a.m. Tuesday in our mountains and deserts. Gusts could reach 65 to 75 miles per hour, with sustained southwest to west winds of 35 to 45 mph. The strongest winds are forecast for Monday afternoon and evening. February 25, 2018 (San Diego’s East County) – A cold front is forecast to bring snow down as low as 2,500 feet in East County on Monday and Tuesday, potentially dropping up to six inches on Mount Laguna as well as two to four inches in Julian. Smaller amounts of snow could fall on Ramona and communities east of Alpine along Interstate 8, such as Pine Valley, Japatul and Descanso, so check weather reports and carry chains if driving in the mountains during these winter weather conditions. Mountain areas along State Route 94 in the Potrero/Tecate divide area could also be impacted. February 20, 2018 (San Diego’s East County) -- Frigid weather across our region caused closure of schools in the Julian and Warner Springs areas on Tuesday. A frost warning has been extended through Wednesday morning. The cold front brought record low temperatures, according to the National Weather Service, including a chilly 23 degrees Tuesday at Ramona in East County’s mountains and 35 degrees in coastal Oceanside. January 26, 2018 (San Diego) -- The National Weather Service has issued a red flag warning due to high fire danger. The warning is in effect from Saturday evening through Monday afternoon for all mountains and valleys across Southern California. Gusty Santa Ana winds, low humidity and temperatures west of the mountains that could be 10 to 22 degrees above normal all contribute to the elevated risk risk. Photo: Montecito mudslide, courtesy Santa Barbara Fire Dept. January 11, 2018 (San Diego’s East County)— In Santa Barbara County, heavy rains turned to tragedy when mudslides caused burned hillsides to collapse, killing at least 17 people in Montecito, where 43 more remain missing as a desperate search for survivors continues. But here in San Diego, this week’s rains brought welcome relief from an unusually dry winter. January 9, 2018, 4:30 p.m. -- The National Weather Service in San Diego has issued an Areal Flood Advisory for San Diego County until 7:00 PM. Doppler radar indicated moderate to heavy rain moving through San Diego County, especially the northwestern sections. This will likely cause urban and small stream flooding in the advisory area from the mountains west to the coast. Rainfall rates of up to one-half inch per hour could locally occur. Some locations that will likely experience flooding include Chula Vista, Oceanside, Carlsbad, El Cajon, Vista, Encinitas, National City, La Mesa, Poway, portions of the San Diego city limits, North Park, Hillcrest and Midway District Including Lindbergh Field. Lemoncrest in Lakeside is closed from Wintergarden Blvd. to Riverview due to flooding in the 12028 block. A high-wind advisory is in effect for I-8 east of Alpine and high-profile vehicles are not advised to travel here. Mapleview at Pine in Lakeside is also flooded. Debris is reported on I-8 west of the Sweetwater bridge in spring Valley. A rockslide has been reported on Japatul Road with large boulders the size of deer; CHP is working to determine exact location of this slide called in. A boulder half the size of a tire is reported in the left lane of Arnold Way at Tavern Road in Alpine. A multi-car accident has occurred on I-8 west at Fletcher Parkway. January 8, 2018 (Ramona) -- With the expected arrival of the strongest storm to hit the region since last winter’s record breaking rainfall, County Fire and CAL FIRE San Diego are taking steps to ensure that they are prepared for any weather-related incidents this week. County officials expect the heaviest rain to arrive early Tuesday and anticipate it impacting the morning commute. 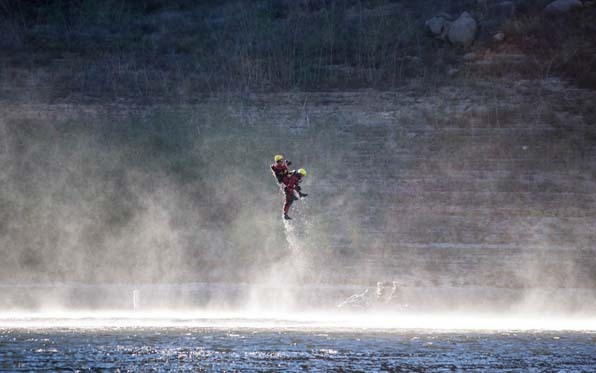 As a result, San Diego County Fire will be activating a swift water rescue team which will be prepositioned in the Ramona area that will be available for immediate response to any portion of the county should the need arise. In addition to the swift water rescue team,CAL FIRE San Diego will have hand crews available for flood fighting operations. January 6, 2018 (San Diego’s East County) – The first significant Pacific storm of the season is forecast to hit our region Monday night through Wednesday morning, bringing up to four inches of rain to mountain areas along with snow above 4,500 feet. Thunderstorms, hail and gusty winds are also predicted. December 22, 2017 (San Diego’s East County) – The National Weather Service has issued a frost advisory for tonight that includes inland desert regions in San Diego County. Temperatures could reach as low as 25 degrees in some places. Pet owners are advised to bring pets inside tonight and to bring in or cover plants sensitive to cold, such as tropical plants or citrus. December 6, 2017 (San Diego’s East County) – With wind gusts forecast up to 90 miles an hour in San Diego’s mountains and valleys, along with low humidity, the National Weather Service is warning of the potential for explosive wildfires. A red flag warning has been extended to Saturday evening. Adding to the danger, many firefighters statewide are deployed to fight major fires burning in Ventura, Los Angeles and San Bernadino Counties, so mutual aide resources could be stretched thin if major fires develop in San Diego County. December 2, 2017 (San Diego) – The National Weather Service in San Diego is warning of prolonged, critical fire conditions in all areas of our county starting Monday morning through the end of the week. A red flag alert is in effect for coastal, mountain and valley areas through Thursday due to low humidity, above average temperatures and strong offshore winds. A high wind warning has also been issued, with Santa Ana winds at 20 to 30 miles per hour and gusts up to 55 miles an hour forecast. October 8, 2017 (San Diego’s East County) -- The National Weather Service has issued a red flag warning for all of inland San Diego County as medium to strong Santa Winds bring very dry and windy weather to our region starting tonight through early Tuesday. Critical fire weather conditions are likely in parts of coastal foothills, valleys and mountain passes. Northeast winds of 25 to 35 miles per hour with gusts up to 55 miles per hour are forecast. This could bring power outages, broken tree limbs and debris on roadways as well as hazardous cross-winds for high-profile vehicles, so use caution if traveling.